As soon as your order is shipped we will offer you access to the online tracking of our courier. There you can find the most up-to-date information available. Please be aware that it might take up to 24 hours from the receipt of your shipping details email before the online tracking is visible. 1. After your order has been shipped you will receive an email which contains the link to the online tracking of our courier. 2. If you are a registered customer you can also go to your Order History under My Account. Go to the order details of the order that you want to track and click on the tracking number in the “Order Number” column. This takes you to the courier's website. After the order has been placed, it will be processed as quickly and carefully as possible and unfortunately cannot be modified or cancelled anymore. If you chose the wrong model or size, you can return it as soon as you receive it. Please refer to our return policy. If you would like to order additional items, please place a new order in our webshop. Your invoice will be sent to you via a separate email. Please note it is currently not possible to enter an alternative delivery address to the billing address. We are confident about the transaction security we offer. Every payment is automatically processed in a secure and protected environment for financial information. If you have received multiple order confirmations with different order numbers, this means you have placed 2 or more orders. If this wasn't your intention, please contact our Customer Service. Due to stock replenishment, it is possible the model you are looking for is no longer available online. For specific model availability queries please contact our Customer Service directly for information on when your model will return. All Crocs™ shoes are uniquely designed and manufactured using our proprietary closed-cell resin, Croslite™, a technology that gives each pair of shoes the soft, comfortable, lightweight and non-marking qualities that Crocs™ wearers know and love. Heat: do not expose your Crocs™ shoes to extreme heat or intense sunlight for an extended period of time. Due to the unique nature of the Crocs™ PCCR material, high temperatures may cause them to warp. Crocs shoes should solely be hand washed. If the model features a lining, it is recommended to put the lining in a mesh fabric or use a delicate cycle (of up to 30 °) if you machine wash. Cleaning your Crocs using the washing machine is at your own risk. Standard: No extra room; fits comfortably snug. Relaxed: A little room; feels more secure on your foot. Roomy: Our most generous, roomy fit. Iconic Crocs Comfort™: Original Croslite™ foam cushion: Feels soft with all day support. Dual Crocs Comfort™: Deep cushion: Feels soft with all day support. Triple Crocs Comfort™: Our most cushion: pillow-top, sink-into-it softness with all-day support. In addition to your right of return and rights under warranty, if your rivet breaks please contact our Customer Service and include your order number (eight numbers and three capital letters, e.g. 00012345CEU) or store where you bought your Crocs™ shoes, size, color and model of the shoe in your request. If available we will send you free rivets. If you have an issue with your straps this will fall under product warranty. We kindly ask you to check the contents of your delivery on arrival. If you have received a defective item, please contact our Customer Service with a short description of the defect. The warranty on Crocs™ footwear applies to defects in materials and workmanship for 90 days from the date of product receipt. If a defect occurs within this time, please contact our Customer Service. We will evaluate your request and determine whether the product will be replaced, returned or the purchase price credited (including shipping costs). Please note: Do not return the faulty item(s) before you receive further instructions. For more information please see our General Terms and Conditions of Sale. Crocs™ footwear is manufactured in China, Italy, Mexico, Vietnam or Bosnia. You will receive a full refund of the purchase price and shipping cost paid for the order, on average, within 10 working days after we have received the original item(s). The refund will be issued to the original card/account. Refunds not related to returns also take on average 10 working days to process. • Except for the UK mainland, we are unable to deliver to islands. • Deliveries to the mainland of UK, France, Spain, Portugal, Denmark and all other mentioned countries in our FAQ's are accepted. • We do not deliver to P.O. Boxes. After your order has been shipped you will receive an email which contains the link to the online tracking of our courier. If you are a registered customer you can also go to your Order History under My Account. Go to the order details of the order that you want to track and click on the tracking number in the “Order Number” column. This takes you to the courier's website. If you are not a registered customer you can track your order by clicking on the track and trace link on the bottom of the homepage. Fill in your order number (eight numbers and three capital letters, e.g. 01234567CEU) and billing last name. On the right side you find the tracking link which takes you to the courier’s website. All Crocs™ product orders are dispatched from The Netherlands. Items are in a like-new condition. Items are returned to us within 90 days after the delivery date. Once you complete the return request, you will receive an email with return instructions which will include a link to the return label. You should receive this email within the hour. Please follow the instructions there. If you did not receive the email, please first check your spam/junk folder, and otherwise contact our customer service. Step 2: Please click the link in the return instructions email to access the label, print the label out, and then stick it visibly and securely to the outside of the return packaging. Then take the package to a local post office and send it to the address on the return label. Please allow 2 weeks processing time, after which the refund for the returned items will be sent back to the card/account used to place the order. 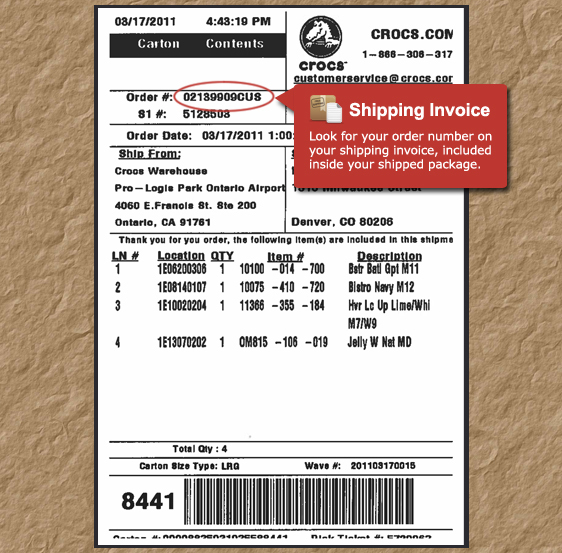 Crocs retail stores do not accept any returns of purchases made online. You can return items from two (or more) different orders in the same return package (and therefore pay only once for return shipping). To ensure that we can process all the returned items correctly, please place a separate return request for EACH order, and stick ALL different return labels on the return package. If for any reason you are not satisfied with your purchase you can always return unused/ unworn items within 90 days. We are unfortunately unable to meet the transport costs of item(s) returning to our warehouse in The Netherlands. Should the item(s) not be deemed faulty (or quality related issue), these costs will be determined by your local postal service. Unfortunately Crocs™ currently cannot exchange any articles. The best way to receive a replacement is to initiate a return (click here for instructions) and to place a new order. Please click on the link ‘Returns’ (under the heading Customer Service) at the bottom of the website you ordered from. Fill in your order number (eight numbers and three capital letters, e.g. 00012345CEU) and the last name on the order, as per your order confirmation. Click on the button ‘Return Item(s)’. Select the item(s) you wish to return and the reasons for each item. Confirm your return request by clicking the button ‘Continue return’. You will receive an email with return instructions which will include a link to the return label. You should receive this email within the hour. Please follow the instructions there. You will receive a full refund of the purchase price for the returned items within 10 working days after we have received the original item(s). The refund will be issued to the card/account used to place the order. Please note: If you have received a defective item, please contact our Customer Service by sending an email to websales@crocs.com. In this email, please include your order number (ending in CEU) and a short description of the defect. Please don’t return the faulty item(s) before you receive further instructions. Sign up for a free account and have a better view on all your orders. Also manage your personal settings such as contact, shipping and payment information. If you wish to create an account, please click here. Please note: If you are signed up for the newsletter this doesn’t mean that you created an account. Likewise placing an order doesn’t create an account automatically. If you have forgotten your password to log in please click here to reset your password. A voucher code is a great way to save money when shopping online. It’s a special code that you enter at the checkout for an instant discount. We advise you to copy/past the codes in the shopping basket. When you enter a valid voucher code on the checkout page, it automatically recalculates the amount due based on the discount connected to the code. Please note: Coupon codes cannot be applied to orders that have already been placed! If you are having difficulties entering your coupon code, please contact our Customer Service before placing the order. Would you like to be kept up to date on our special promotions? Sign up for the newsletter here and save €15 discount on your next order of €50+. Our newsletter contains information about our special offers and updates about our new models. If you would like to sign up and save €15 off your next order of €50+, please click here. Find your local Crocs™ stores and Crocs™ dealers using our shop locator map and location service.